China releases schedule showing 67 ivory retail outlets and ivory carving factories closed today, with the rest to be shut down by the end of the year. China announces a donation of USD100,000 to the CITES Secretariat in support of implementing the outcomes of CITES CoP17, in addition to the 250% increase in its contribution to the CITES regular budget since 2010. The population of Asian elephants in China is healthy and increasing. Beijing/Geneva, 31 March 2017– The government of China announced on 30 December 2016 the closure of its domestic ivory market by the end of 2017 to fulfil the commitments jointly made by the presidents of China and the United States of America in September 2015. The first batch of the ivory carving factories and retail outlets were closed today as witnessed by the visiting CITES Secretary-General, John Scanlon. China’s announcement was made following the adoption of a decision at the 17th meeting of the Conference of the Parties (CoP17, Johannesburg, September/October 2016) that calls for the closure of domestic markets for ivory. Immediately before the arrival of the CITES Secretary-General, the State Forestry Administration made public a schedule for the implementation of the closure that affects all of the ivory carving entities and retail outlets across the country, with 67 being closed as of today. The remaining 105 carving entities and retail outlets are scheduled to be shut down before 31 December. 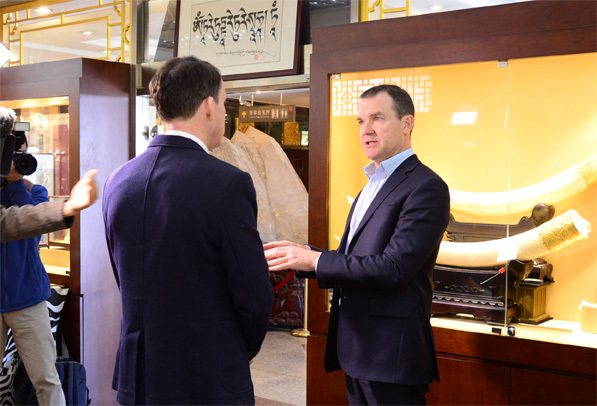 Accompanied by the State Forestry Administration, which is the CITES Management Authority of China, Mr.Scanlon visited today some ivory carving factories and retail outlets, including the Beijing Ivory Carving Factory, the best known ivory carving factory in the country, as well as one of its retail outlets to be closed today. On 29 and 30 March, the CITES Secretary-General had a series of meetings with the State Forestry Administration, the Ministry of Agriculture and General Administration of Customs where the ministries reported on the progress made in the implementation and enforcement of the Convention, particularly the CoP17 decisions. During the meeting with the State Forestry Administration, the Chinese government announced the donation of USD100,000 to the CITES Secretariat in support of implementing the outcomes of CoP17. There is a possibility that this will be the first of its regular annual extra budgetary contributions to the Secretariat. China’s contribution to the regular budget of the CITES Secretariat has also increased by 250% since 2010. During the visit, it became apparent that finding alternative livelihoods, including alternative carving materials for the licensed carving factories, and the disposal of legal raw ivory and unsold worked ivory after the trade ban remain as challenges facing the government and the enterprises. The government is however determined to move ahead with the closure, while looking at all possible solutions. “I am greatly encouraged to see first-hand how the bold decisions taken by CITES Parties at CoP17 are being translated into equally bold actions on the ground in China, and we express our deep appreciation to the government of China for its strong leadership. The ultimate goal of the closure of domestic ivory markets is to stop the illegal trade in ivory. It must be supported by ongoing law enforcement and international cooperation right across the illegal supply chain. As far as destination countries are concerned, this includes ongoing efforts to prevent the laundering of illegally sourced ivory carvings, such as with mammoth ivory and antique elephant ivory carvings. China has led through its actions, which serves as an inspiration to other destination countries to follow, as well as for range and transit countries”, concluded Scanlon. This is Secretary-General Scanlon’s 7th official visit to China since being appointed as Secretary-General in 2010, with previous visits including: meeting with Vice Premier Wang Yang in 2015 after opening the workshop on demand side strategies on combating illegal trade in ivory, co-organized by the CITES Secretariat and the Chinese government, speaking at the first ever destruction of confiscated ivory in China in Dongguan in January 2014, speaking at the first destruction of confiscated ivory in Hong Kong (China) in May 2014, meeting with all of the Chinese Management Authority staff at its annual retreat in 2013, and celebrating the 30th anniversary of China joining CITES in the Great Hall of the People in 2011, after which he met with the National Inter-Agency CITES Enforcement Coordination Group. Wildlife conservation presents challenges for all countries. But for China, the difference is one of scale. China is the most populous nation in the world representing close to one fifth of the world’s population and the fourth largest country by land area, sharing borders with 14 countries. China is now the second largest economy in the world with an ever-growing buying power of its people coupled with a long tradition of utilizing wildlife, including for food and medicine. At the entry points in Shenzhen alone, 654,000 people entered mainland China from Hong Kong SAR every day in 2015, totalling 239 million in that year, along with 42,500 vehicles each day. In 2016, over 35 billion courier packages were registered across the country. Despite the challenges, China has achieved many great successes in protecting its wildlife, which can serve to inspire many other countries. The wild population of Asian elephants in China is one of the few in the world that is healthy and growing. And the giant panda was removed from the list of endangered species in the IUCN Red List last year thanks to the success in protecting the species in the wild. Both species are listed on CITES Appendix I. These successes are the result of sustained efforts and resources allocated to wildlife conservation that are commensurate with the challenges. For example, China, as one of the megadiverse countries in the world, has set up 2,800 nature reserves representing nearly 15% of its land territory, ranking second in the world. It has completely banned the cutting of natural forests across the country. A Party to CITES since 1981, China has the world’s largest CITES Management Authority with close to 170 staff working full time to implement the Convention. The National Inter-Agency CITES Enforcement Coordination Group (NICECG) was established in December 2011 to facilitate the collection and exchange of intelligence, enhance capacity building, and coordinate joint enforcement activities across the country. Chinese customs is an extended arm and stronghold for the implementation and enforcement of CITES. In Shenzhen, the 6,000 customs staff, the largest in the world in any one city, seize more wildlife products than anywhere else in China. China has one of the toughest criminal laws for wildlife crimes, carrying a maximum penalty of life imprisonment, with the death penalty being abolished a few years ago. Wildlife criminals are regularly being arrested and prosecuted. Recently 32 people were sentenced up to over 10 years in prison for illegal trade in pangolins. 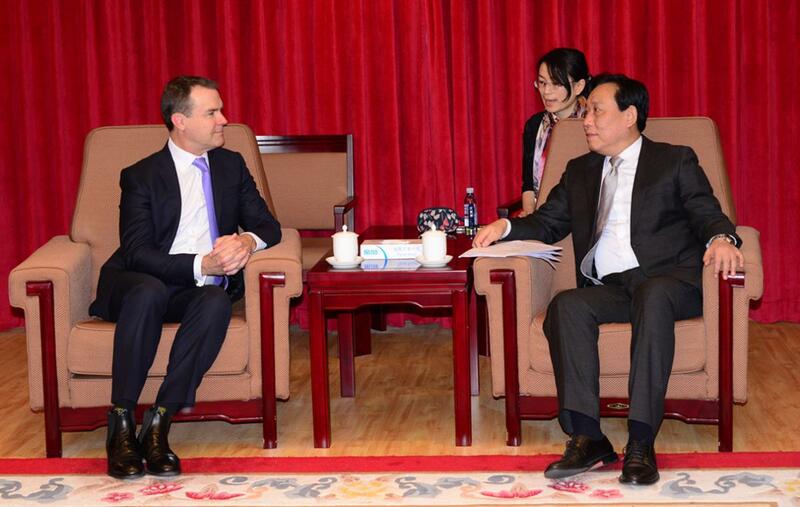 China has also actively engaged in CITES-related multilateral initiatives. For example, Operation Cobra, the largest and most successful cross-continent wildlife law enforcement operation, was initiated by China in 2012. With 183 Parties (182 countries + the European Union), the Convention on International Trade in Endangered Species of Wild Fauna and Flora (CITES) remains one of the world's most powerful tools for wildlife conservation through the regulation of trade. Thousands of species are internationally traded and used by people in their daily lives for food, health care, housing, tourist souvenirs, cosmetics or fashion. CITES regulates international trade in over 35,000 species of plants and animals, including their products and derivatives, to ensure their survival in the wild with benefits for the livelihoods of local people and the global environment. The CITES permit system seeks to ensure that international trade in listed species is sustainable, legal and traceable. CITES was signed in Washington D.C. on 3 March 1973 and entered into force on 1 July 1975.